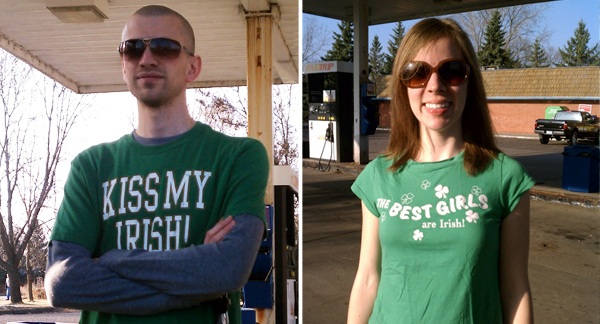 One of the weird things about my husband is his undeniable love of St. Patrick's Day. What's even weirder is that this love existed *prior* to any knowledge that it is also my birthday! Fortunately, this works out really well for both of us. I have no problem basking in the frivolity of the people around us celebrating a holiday for which I truly have no heritage [yeah, my shirt's a sham], all the while letting my inner child believe they're celebrating my birthday, too. He has no problem seeing the parade every year, listening to Irish music, watching Irish dance, and proudly sporting some green. 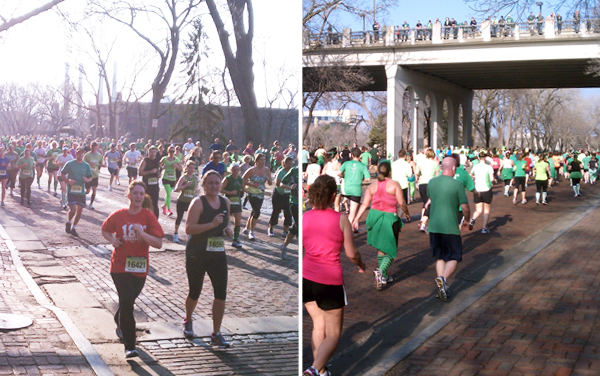 This year, we started the day off eating breakfast at the Wilde Roast Cafe [absolutely delicious, btw, and fabulous coffee] on St. Anthony Main - where there just so happened to be in perfect viewing position of the Get Lucky 7K! Believe it or not, there have been years where we're the only ones dressed in green at breakfast. Thankfully this wasn't the case in 2012. After breakfast, we found parking in St. Paul and then went on the hunt for a place to watch the parade. St. Patrick's Day landing on a Saturday means the city is crazy busy! 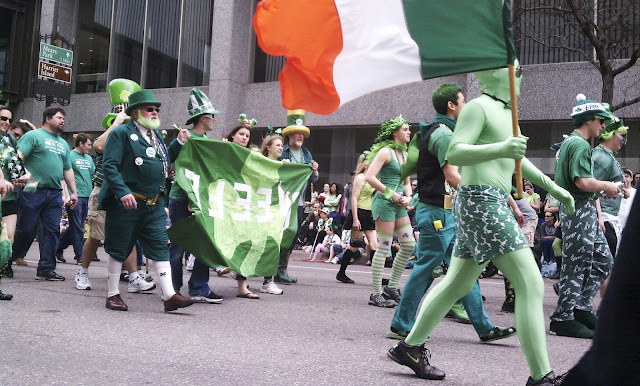 The majority of the parade is family groups walking together, showing off their Irish pride...and silliness [Note the green body suit]. There was also an Irish Elvis, some bagpipe players, some dancers, bouncers, and even Vulcans. Despite the poor odds of actually finding someone you know in the vast crowd, we managed to do just that. While making our way to the Landmark Center, who did we find on the sidewalk but the lovely couple Josh & Mikalah! It was fun catching up with them and having others to people watch with us for a bit. After the parade, we walked around in the glorious weather, decided most establishments were already too crowded for us, and headed to the Landmark Center for more "reserved" entertainment. 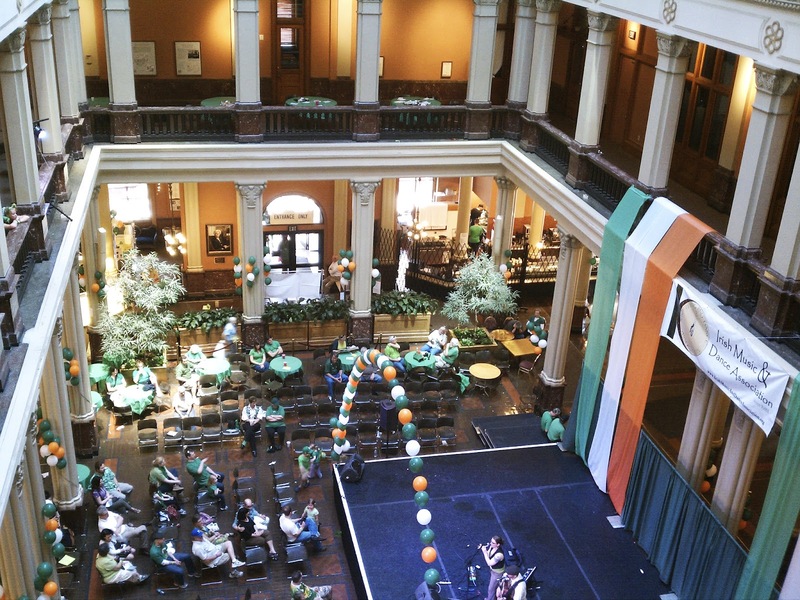 By that time, their music and dancing schedule was almost complete, but we did manage to catch some nice folk music, Irish singing, and Irish dancers. Plus the building is beautiful. And they have clean bathrooms. It's really quite a haven. I wonder what next year will bring!